In this instantly down-loadable Ebook, veteran plasma physicist John Brandenburg reveals the new theory that finally accomplishes what Einstein failed to do: the GEM Unification Theory proves the mathematical and physical interrelation of the forces of gravity and electromagnetism! This theory vindicates Einstein’s dedication to unifying the fields in the final labor of his life. He shows the intricate interweaving of Einstein’s work with that of other physicists, including Sarkharov and his “zero point” theory of gravity and the hidden fifth dimension of Kaluza and Klein. He also traces the surprising, hidden influence of Nikola Tesla on Einstein’s life. Brandenburg describes control of space-time geometry through electromagnetism, and states that faster-than-light travel will be possible in the future. Anti-gravity through electromagnetism is possible, which upholds the basic “flying saucer” design utilizing “The Tesla Vortex.” A must read for any person interested in UFOs and leading-edge physics. See the physics used at Area 51 explained! 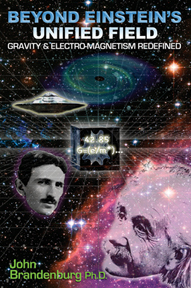 Chapters include: Squaring the Circle, Einstein’s Final Triumph; Mars Hill, or the Cosmos As It Is; A Book of Numbers and Forms; Kepler, Newton and the Sun King; Magnus and Electra; Atoms of Light; Einstein’s Glory, Relativity; The Aurora; Tesla’s Vortex and the Cliffs of Zeno; The Hidden 5th Dimension; The GEM Unification Theory; Anti-Gravity and Human Flight; The New GEM Cosmos; Summit of Mount Einstein; more. Includes and 8-page color section.